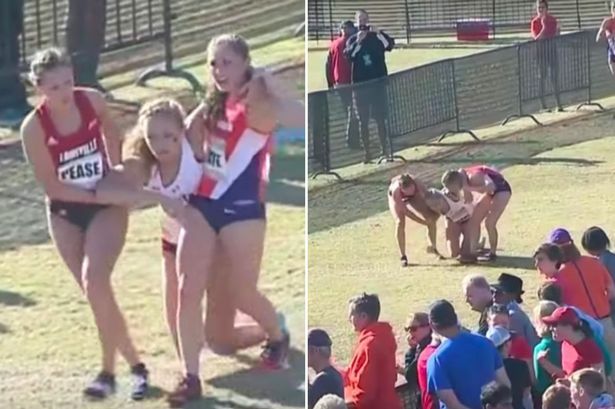 This is the moment a pair of cross country runners showed an amazing display of sportsmanship at the end of a gruelling race. 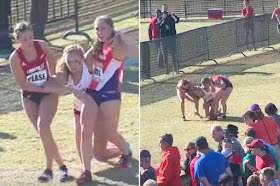 Madeleine Adams was only about 20 metres from the finish line when she collapsed. As she struggled to get back to her feet, rivals streamed past. But then two fellow athletes Evie Tate and Rachel Pease decided to stop, and carry their competitor to the line. Adams, who was competing for Boston College in the Atlantic Coast Conference championships, was ultimately disqualified. But she said she was grateful for the goodwill shown by Tate and Pease. She told CBS: :The great part that comes out of this is there are two amazing girls that helped me, who are completely selfless and just amazing people with amazing character. "I knew I had run the hardest race of my life."